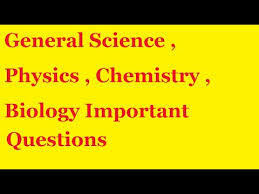 Physics related questions and answers Part 25 And Physics questions and quizzes, quiz on Physics, important Physics, important Physics and questions, general knowledge questions and answers related to general science And physics general knowledge objective questions answers are important in like RAS, IAS, UPSC, RPSC, 1st, 2nd, 3rd Grade Teacher, REET CTET, LDC, SSC CGL, IBPS, MBA, CAT, MAT, SBI-PO, RBI And Railway, Indian Army And all competitive Exams. Question (1) The working principle of the washing machine? वाशिंग मशीन का कार्य सिद्धांत है? Question (2) In a lift, the direct load of a person is less than the actual load when the lift is going? एक लिफ्ट में किसी व्यक्ति का प्रत्यक्ष भार वास्तविक भार से कम होता है, जब लिफ्ट जा रही है? Question (3) The needle of the iron is submerged in water but the ship floats, based on which principle? पानी में लोहे की सुई डूब जाती है लेकिन जहाज तैरता रहता है, यह किस सिद्धान्त पर आधारित है? Question (4) An ice slab is floating in a glass of water when the ice melts, what effect will the temperature of the water? पानी के एक गिलास में एक बर्फ का टुकड़ा तैर रहा है, जब बर्फ पिघलती है तप पानी के स्तर पर क्या प्रभाव होगा? Question (5) Will there be a candle of flame in the state of weightlessness? भारहीनता की अवस्था में एक मोमबत्ती की ज्वाला का आकर हो जाएगा? Question (6) Whose unit is not Newton-meter? किसकी इकाई न्यूटन-मीटर नहीं है? Question (7) Matter of heating the object? वस्तु को गर्म करने पर उसके अणुओं? Question (8) Which of these is not a thermometer? इनमें से कौन ऊष्मा का मात्रक नहीं है? Question (9) When the water falls from the height than its fever? जब जल ऊंचाई से गिरता है तो उसका ताप? Question (10) Where will it take longer to cook rice? चावल को पकाने में कहाँ अधिक समय लगेगा?